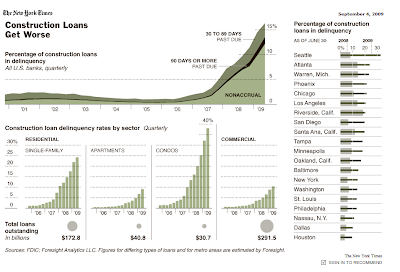 The New York Times has an interesting article about construction loans that Inquiring minds will want to read. Please consider Construction Loans Falter, a Bad Omen for Banks. Reports filed by banks with the Federal Deposit Insurance Corporation indicate that at the end of June about one-sixth of all construction loans were in trouble. With more than half a trillion dollars in such loans outstanding, that represents a source of major losses for banks. Construction loans were highly attractive in recent years for many banks, particularly smaller ones without a national presence. One reason was that other types of loans were not easy to make. A handful of big banks came to dominate credit card loans, for example, and corporate loans were often turned into securities. Construction loans, however, needed local expertise and were not easy to standardize. In a booming real estate market, there were few losses on such loans. It is in commercial real estate construction — be it stores or office buildings — that the pain seems likely to rise. At the end of June, $291 billion in such loans was outstanding, down only a few billion from the peak reached earlier this year. Foresight estimates that 10.4 percent of commercial construction loans are troubled, but expects that to increase as the year goes on. Local Expertise? What Local Expertise? One has to laugh at the statement "Construction loans, however, needed local expertise". In regards to "local", Pray tell what did Chicago-based Corus bank know about condo construction in Florida, California, and Georgia? Indeed, what expertise was displayed by anyone, anywhere in regards to construction loans? 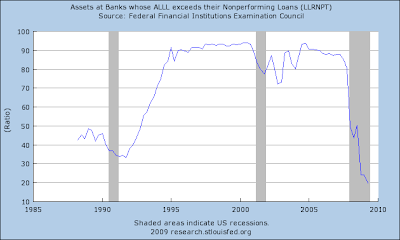 Just how bad an omen this is for banks depends on whether or not the problem is getting worse (it is), and how much banks have allocated in loan loss provisions. In regards to loan loss provisions, here are a few pertinent charts from How Overpriced Is The S&P 500?